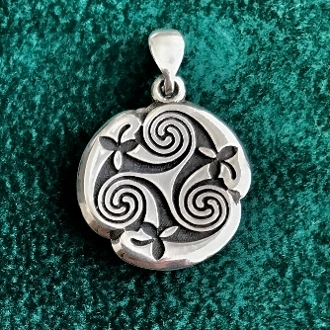 This size is around 5/8" diameter pendant. In a desire to continue my unique expression of traditional themes, I took the liberty of removing the central spirals of this pattern type from any surrounding border enclosure. Much of the work done by the Scribes was very linear and comparmentalized, yet at the same time, many images flowed from one to the other. In this spirit, I allowed the organic nature of the design to exist both with and without borders and created both types in my Spiral exploration.